Just 2 years ago, Tri Alliance had 55 athletes that made the annual trip to participate in the Noosa Multi-Sports Festival. 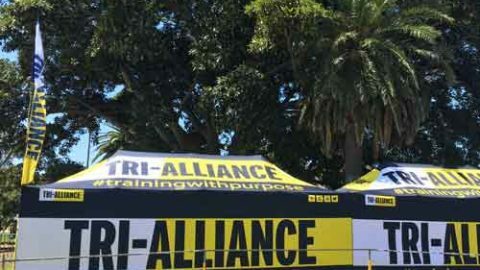 Fast forward to 2013, and Tri Alliance had close to 150 athletes from Tri Alliance Victoria and Tri Alliance Queensland participate in this this iconic event in Sunny Queensland. The race is famous for it’s mass participation (over 5,500 competitors in the Olympic Distance Triathlon) along with the celebrations that follow the race, and when Tri Alliance turns up to race, you know you are in for a good time! Race morning the conditions were near perfect with only mild wind, but the forecast was for a hot one with temperatures over 30deg. Those athletes leaving in the later wave starts were going to ‘enjoy’ the full brunt of the Noosa heat, and for our Victorian Athletes it was going to be important to hydrate and stay cool on the run. The swim for this event is not in the beach as you may imagine, it is held in a canal just off the main beach, with the waters a little murky it makes for a safe flat swim course, and more often than not a non wetsuit swim with temperatures checking in just over the 24deg cut off. The bike course is traditionally fast. The first and last 10km of the course are a little technical with roundabouts and a few speed humps thrown in, but the middle 20km is as fast as you will get – not to mention the 3km Garmin Hill climb and the famous Noosa Hill decent where athletes regularily clock between 70-85km/hr! The run course is flat and also traditionally fast, with tree cover over part of the course, plenty of spectators and more than enough age group athletes to chase down or be chased! And this year was no different with record numbers of athletes participating. Noosa not only attracts the large numbers, but it also attracts the best Olympic Distance athletes from around Australia and the male and female Elite races were not to be missed. In the mens race, Aaron Royle took his second victory in as many races. Big things coming for this young fella. The females race got off to an interesting start with a snake having to be ‘shooed’ off the swim course, but this didn’t scare the fastest females in the country. The a hugely stacked field at the starting line finished with Emma Moffatt, Ashleigh Gentle and Melissa Haushildt on the podium in this prestigious Australian race. The Age group waves started at 6.30am and the last wave didn’t go off until after 9.00am – so you can just imagine the number of athletes streaming in throughout the morning, and with the number of Tri Alliance athletes on course, it made for a great spectator sport and the TA Tents were the perfect vantage points to cheer our athletes in as they rounded to the finish line. Tri Alliance Victoria kick started the day in the Open Waves, with Coach Ryan Bourke in the Male Open Category. With the Elite Fields so heavily dominated by pro athletes, the Open Category allows a bridge for the second tier of athletes to race against some of the best in the country. Coach Ryan had big expectations with his second year racing this category he was looking to better his performance and position this year. Coming out of the water just off the front pack meant he was going to have to chase all day on the bike. But with the front riders working together he was just out of touch all day, but finished with a solid run and just shy of the 2hour barrier with a 2:00.45 and 7th Open Male. Top effort. Our second athlete across the line was Xavier Flynn – who by his own accounts didn’t have the race he was after, but finished in 2:14.54 and leaves him with a few things to work on and an even bigger desire. So stick at it Xav. Our first female across the line was Coach Sarah, just 3 weeks post Kona decided to return to Noosa where she placed third here 2 years ago. And with time post Ironman to recover just enough and plenty of endurance in the tank, she came away with a solid race in 2:20.39 and 3rd F3034. Within the next 10min we had some very solid performances who claimed the sub 2.30hr barrier including Catherine Allison 2:21.44 and 5th F25-29, Tim Grant 2:22.07, Jody Biddle 2:22.40, Simon Madden 2:29.04 and Jared Faulkner 2:29.58. Great work for this group of athletes who all have bigger races coming up. Between 2.30-3hours we had a flood of athletes, each with differing goals and emotions for this race. We’ve got athletes who were racing this as their A race, others for fun, those searching for PB’s. Well done to all those who broke the 3hour barrier. Always great to see a 2 in the front of your race time! If you haven’t experienced the Noosa Multi-Sports Festival, then make sure you put it in your calendar for next year! Tri Alliance will again be supporting this fantastic race next year and spends a week acclimatising, training, having fun, soaking up the sun and atmosphere (and racing!) and everything that this event brings. Entries open for next year’s race NEXT WEEK so if you are wanting to enter – you will HAVE to lock this in your diary! Click here to read more. CLICK HERE to view our photos from the weekend. CLICK HERE to view USM Highlight Clip from the race. HELL WEEK 2015 – GET IT ON!